Okay, so I'm really, reaaallly excited about this one for so many reasons. For one: I've found a way to hide eggplant and zucchinis (which are cloning themselves in my backyard, and apparently are the same thing in my CSA farm, which means there's entirely too much to go around. *le sigh* It's kale month all over again...). For another: This thing tastes pretty darn close to real, and it looks pretty darn close to real, and... The Carnivore liked it. 'Nough said. 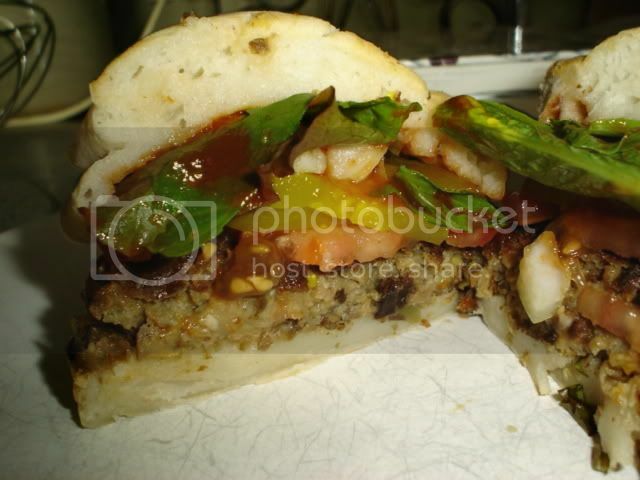 I picked up a lot of tips and tricks from my raw-foody friends and decided to use them in the making of these burgers. 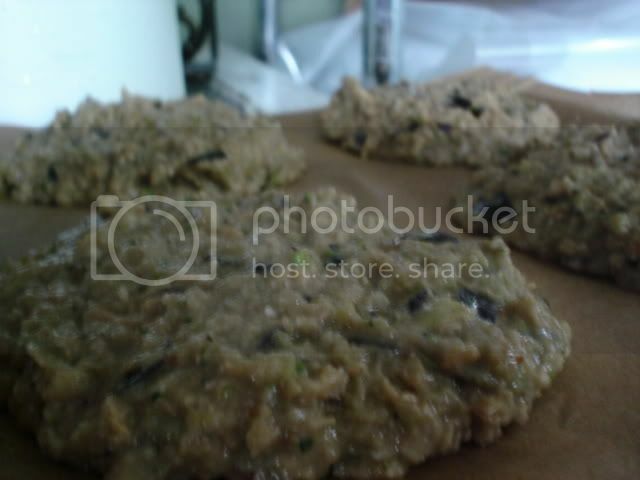 The whole dehydrating thing solves a lot of the problems we Martha-Stewarts tend to have with homemade veggie burgers-- you know, too wet, too crumbly, won't stay together, gets soggy... whatever. If you wanted to make the burger vegan, you could easily sub in flax-egg for the eggs. And, I suppose you could make this raw by simply dehydrating the things for an extra couple of hours. As for me and mine, we chose to go all the way and ate these, cooked, on nice fluffy fresh GF white hamburger buns with lots of crinkle fries and some cucumbers. 1. 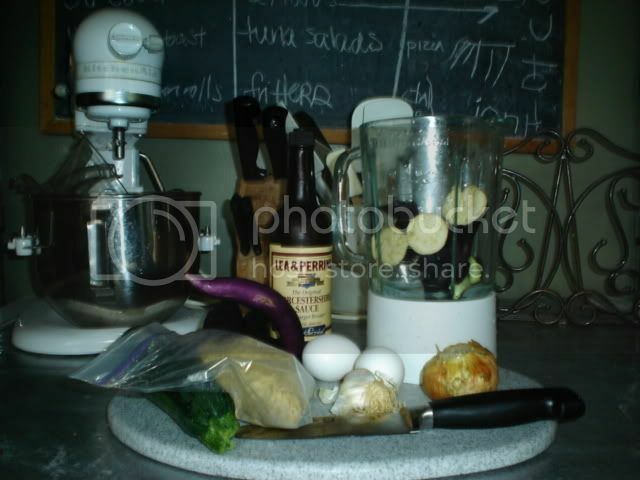 IN blender, grind 3 cups of the eggplant, the zuchinni, the onion, garlic, black pepepr, oregano, and Worcestershire sauce, until smooth. 2. 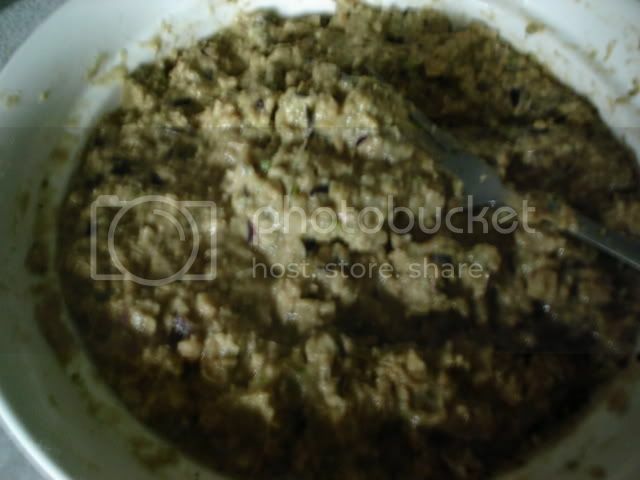 Add the rest of the eggplant and blend until chunks the size of peas remain. 3. Add the almond parmesean mixture, flour, and tvp. Let sit for 10-30 minutes. 4. Line several baking sheets with parchment paper. 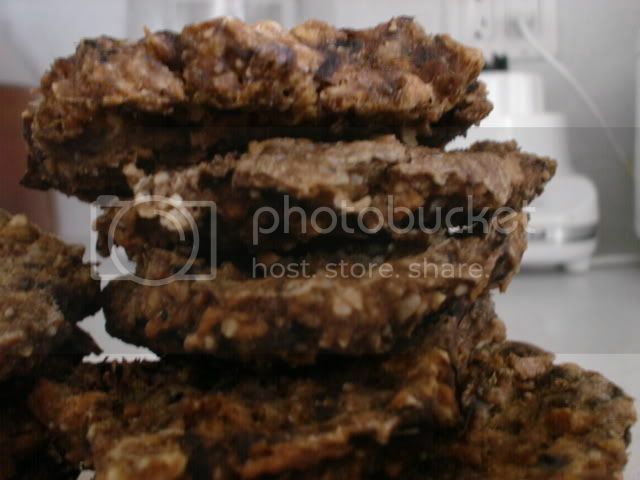 Using a spoon and your hands, form the mush into burgers on the paper (this will be soupy, like soupy oatmeal). 5. Dehydrate in the oven at 110 degrees for 6-8 hours, flipping after three hours (carefully!) to ensure both sides get done. 6. Fry in oil right before serving (we like coconut oil!). Assemble burgers and eat. Love all the food, as always. 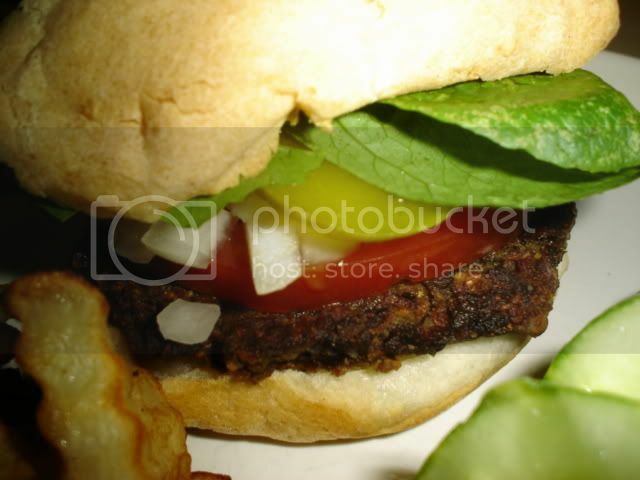 These are beautiful veggie burgers. Thanks for sharing! sea, you could just use your oven. set to warm... it's the right temp. Or try Craig's List... or Freecycle. Guarantee if you put the word out, you could get one for free. (I did). LOL... I had to post in one gulp. I'm desperate to de-meat myself. UGH. Imagine not eating much meat for 6 months...then no meat for 2... and suddenly having to eat it 3 meals a day for two weeks. (and the first week being at a crap resort where nothing was organic, etc. So you can imagine the meat....issues). My digestive system is wrecked. I think I'm going to try your grilled tortilla thingys for lunch today! yum. Thanks, Sheltie girl! Nice to 'meet' you! Worcestershire sauce is not vegetarian. If you are cooking with it, read the ingredience. They do make a vegitarian version, but if it doesn't state it, it probably has fish in it. The vegetarians I know do eat fish and other animal products like cheese, milk and eggs. However, vegans do not any animals or animal products.